The importance of proper nutrition and keeping the body fueled with vitamins is inarguable. Still, the dangers presented by vitamin deficiencies, as well as best practices for supporting the skin (and overall health) with supplements is not universally understood by each client. Thus, it is critical for professionals to understand how vitamins and supplements work in the body and best practices for incorporating them into a regimen. The secret is out: healthier lifestyles make for happier bodies – and that includes the skin! It seems that every day there is a new app or tool to make daily exercise easier. There are subscription boxes to bring healthy diets to the doorstep and even traveling meditation trucks and nap pods at some progressive office spaces. Healthy living is no longer a chore – it is a movement many consumers want to get behind. With so many options being marketed, it can be confusing to understand what each individual truly needs to improve their skin and body health. This is not unlike daily nutrition information. There are serving sizes and daily recommended allowances, but what does that all mean to an individual? Recommended daily allowances based on serving size are standards put into place to keep individuals alive and protect against historical nutrition disorders, like scurvy and rickets. But what about solutions for boosting overall wellness? Most clients are interested in achieving wellness goals beyond their baseline needs. They want to help prevent the number of diseases and disorders stemming from internal inflammation. They also want to satisfy a desire to care for the largest and most visible organ of the body, the skin. To do so, consuming a healthy and well-balanced diet may not be enough. The skin is the largest organ of the body. However, it is also the last organ to receive any of the benefits from food and drinks consumed. When individuals eat a balanced and nutritious diet and drink sufficient amounts of water, they feed their internal vital organs first and their skin last. Many people drink eight glasses of water per day but still end up with dry and dehydrated skin. With all of these accumulating factors, it is a smart decision to take health and self-care one step further. Incorporating supplements into a healthy diet and lifestyle will not only provide incredible results internally, but external, visible results, as well. There are 50 vital nutrients needed to keep a body healthy. Thirty-six are vitamins, minerals, and healthy fats that can be consumed through diet, as well as supplements that support the body and skin. Many of these vitamins, minerals, and fats are also produced naturally by the body. That said, there is one essential fat that a body cannot make on its own and that is omega-3. This essential fatty acid must be taken in from outside sources. Foods such as fish, nuts, and flaxseeds are heavy in omega-3s. This is also one area where supplementation becomes essential. One also needs to consider factors like lifestyle, environment, diet, and genetics. These can all effect how quickly bodies metabolize important nutrients. If default levels of a nutrient are low, negative effects can be seen in the body, such as disease, inflammation, and premature signs of aging. Supplements are the answer to supporting these low levels of varying nutrients. There are multiple skin complications that stem from nutrient deficiency. They can range from minimal skin concerns to more life-threatening complications. One nutrient essential to body and skin function is vitamin A. Vitamin A plays an integral role by increasing cell proliferation rate, supporting the skin’s immune system, increasing Langerhans and T-cells, and boosting eyesight. Vitamin A deficiency has been linked to keratosis pilaris. The non-medical term for this is chicken skin. It manifests as pesky, red, inflamed bumps that appear on the back, arms, thighs, and even buttocks. In more extreme cases, a lack of vitamin A manifests into phyrnoderma, otherwise known as toad skin, which is more intense and includes raised plaques that can appear on all areas of the body. Another essential nutrient is vitamin D. The body can produce vitamin D on its own with just 20-minutes of (SPF protected) time in the sunshine, but there are some serious consequences to not getting enough every day. Lack of vitamin D has been linked to keratosis pilaris and is a direct link to acne, as well. Without vitamin D, the body is unable to fully support the endocrine system, which is responsible for balancing hormones. When hormones are unbalanced, oil production and levels are disrupted, which leads to acne. Vitamin D can also affect T-cells, part of the immune system. With low levels of vitamin D, T-cells act slow and sluggish, making it harder for the body to fight off any sort of infection. This becomes apparent when trying to heal after an acne breakout and is one reason why individuals tend to get sick more often in the wintertime (less sun and vitamin D). Lack of antioxidants can also be quite damaging. Free radicals travel throughout the body, stealing electrons from healthy cells, which causes damage to healthy cells. Simple things like ordinary metabolic processes within the body and immune system responses can cause free radical damage, otherwise known as oxidation. However, it can also be caused from external sources. Eating foods that have been deep-fried or barbecued, alcohol, tobacco smoke, pesticides, pollutants, and, of course, ultraviolet sun damage all cause free radical damage. Oxidative stress on skin cells can lead to sun damage, hyperpigmentation, and even cellular death. Mighty antioxidants are invaluable tools that can stop free radicals in their tracks, by lending an electron. By supplementing the body with antioxidants, the body is reinforced in its ability to fight damaging free radicals. 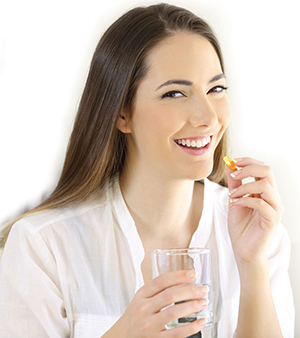 Taking a skin care-based supplement is truly feeding the skin from within. When taken orally, a supplement is digested into the gut, where it is then carried through the bloodstream. From there, it travels to the capillary loops, which feed the living layer of the epidermis. Specific skin disorders or conditions typically occur in the deeper layers of the epidermis that cannot be reached via topical treatments and products alone. Below are key nutrients that, when used via supplements, can have direct impact and improvement on skin health. Skin care supplements rich in omegas can help rebuild lost lipids on a deeper level, thus treating symptoms of dryness and dehydration. Omega-3s, especially those found in fish oils, are an extremely potent form of fatty acids, which is what helps rebuild the lipid bilayer. When fish eat marine plankton (which is rich in alpha linoleic acid, a fatty acid), it is digested and converted into eicosapentaenoic acid (EPA) and docosahexaenoic acid (DHA), which are more potent than just alpha linoleic acid alone. Omega-6, when harvested from evening primrose oil, has shown incredible anti-inflammatory benefits and can aid in overall women’s health. It can also help prevent hormones from going into overdrive and can help even out estrogen, testosterone, and insulin. This can result in regulated menstrual cycles, reduced breast tenderness, and help with some PMS symptoms. Supplements high in vitamin A can work on a number of different skin issues. As it ages, the skin’s cell turnover rate begins to decline rapidly, leaving a dull and devitalized skin tone, as well as visible fine lines and wrinkles. Vitamin A can help speed up skin cell turnover rate and create a smoother, more even skin texture. Vitamin A is also a pivotal player when it comes to treating acne. It helps reduce the thickening of the skin due to retention hyperkeratosis (holding onto too many skin cells) and it can help balance oil production. 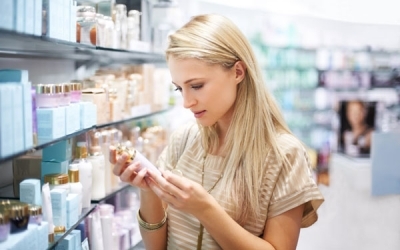 Another large player in the world of supplements for acne is diindolylmethane (DIM), a powerful anti-inflammatory. This phytonutrient comes from raw cruciferous vegetables (think broccoli and cauliflower) and it can also have a very powerful effect on balancing hormones. DIM is known as an anti-androgen, meaning it has the ability to block acne-causing hormones like testosterone. It also has a positive effect on estrogen metabolism, which can help with treatment and prevention of hormonal breakouts. When it comes to hard-to-treat skin complications, such as hyperpigmentation, antioxidants are key. Not only do they help fight free radical damage on a cellular level, but they can also help protect skin’s structural support – collagen. While humans are able to produce antioxidants on their own, due to the amount of free radical damage they encounter on a daily basis, they must also obtain them from supplemental sources. 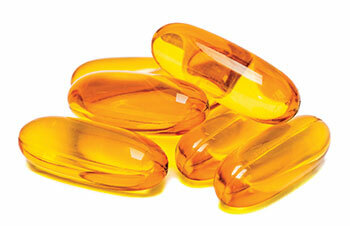 Omega-3 is a natural blood thinner and should be avoided by clients taking medically-prescribed blood thinners. A is retinyl palmitate, which is derived from beta-carotene. Vitamin A can also be toxic at very high levels in the body, so it is important to know the source of the supplement. Maximum recommended daily intake is around 10,000 IUs. Women who are pregnant, trying to become pregnant, or breastfeeding should always consult with a doctor before introducing anything new into their diet when it comes to supplements. 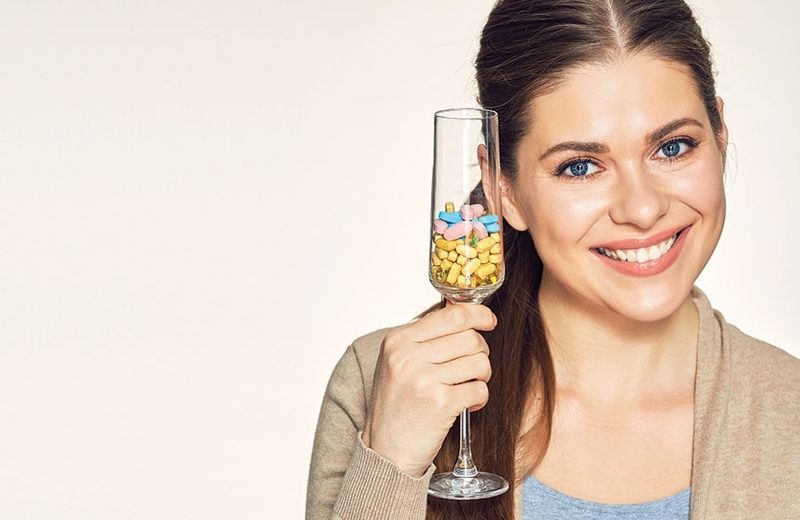 Supplements are a wonderful addition to anyone’s skin care regimen, but, when in doubt, it is always a good idea to have a client consult their physician for final approval. Offer to provide a copy of the ingredients so that they may show them to their doctor. Advise clients that, while incorporating food-based supplements into their regimen is typically fine, it is ideal to get the go-ahead from their physician before moving forward with a new routine if they are unfamiliar with the medications they are taking, have any specific health circumstances, or are under specific medical supervision. Discussing the importance of supplements is now an integral part of the job of a skin care professional. Topical solutions may no longer be adequate on their own. When working with topical skin care and treatments, professionals are working on the outer most layer of the epidermis, the stratum corneum. Certain products are able to penetrate this layer and work their way down, but cosmeceuticals cannot penetrate deep down into the dermal layers, which is where all the magic happens. The dermal layer is where collagen, elastin, and hyaluronic acid are found and is what gives skin structural support. Blood supply is also found there, and this blood supply feeds the basal layer of skin. The basal layer is where stem cells are giving birth to new cells that will eventually be pushed up and become the stratum corneum. By feeding the skin from the dermal layer via the bloodstream, a much larger impact on skin cells is created. This will, in turn, lead to better cellular function, as well as interaction with any topical treatment applied to the skin. Eventually they will meet in the middle and work synergistically together. 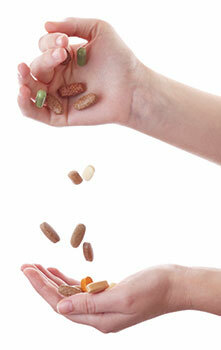 Do not look at supplements as just another vitamin. Look at them as internal skin serums. Teach clients to feed the skin from within with vital skin nutrients, fortify it with topical treatments and skin care, and finish it with clean, healthy makeup that also provides SPF. Adding supplements to their daily skin care regimen can give clients that power boost and next level of wellness they are seeking. 1 “Dietary Supplements Market Size Worth $278.02 Billion By 2024.” Grand View Research.https://www.grandviewresearch.com/press-release/global-dietary-supplements-market. 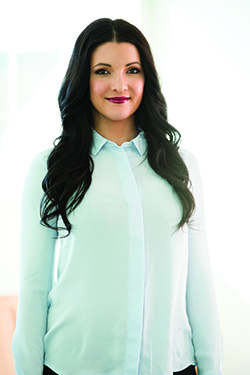 Hannah Hatcher is a global educator for jane iredale, makeup artist, and aesthetician. Hatcher discovered jane iredale’s line of mineral makeup at one of her first jobs in a full-service salon and day spa, purchasing PurePressed Base Mineral Foundation with her first paycheck. Hatcher realized she wanted to attend beauty school to pursue her love of makeup and skin care. Hatcher taught post-graduate skin care for seven years with the International Dermal Institute and now teaches artists across the world about jane iredale. She believes that to achieve beautiful results with makeup, skin should be the clear and healthy canvas.